Feeling squeezed? It's official: if you're not in management, the value of your paycheck is dropping at an alarming rate. Feeling squeezed lately? It’s not your imagination. Numbers just released by the Bureau of Labor Statistics confirm that the value of a typical paycheck is shrinking at an accelerating pace. Jared Bernstein, senior economist here at the Economic Policy Institute, knew to expect a grim set of numbers in the monthly release today, but even he was surprised at how bad it was. First, hourly wage growth has slowed for the 80 percent of US workers who aren’t managers. Second, inflation is picking up, driven largely by higher prices for gas and heating. 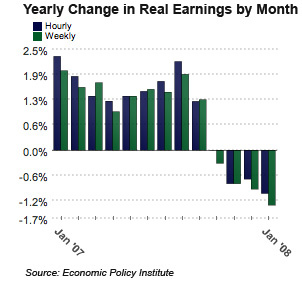 And third, employers are cutting back on hours. The upshot is that–unlike last year, when real wages actually grew by about 2 percent–workers are losing ground, to the tune of about 1.4 percent in weekly pay last month. With a softening economy and rising unemployment, there’s no reason to think the shrinking paycheck trend won’t continue. Wage growth is likely to be slow or nonexistent for the rest of this year as competition for jobs stiffens. The rate of inflation is less predictable, but many economists believe that energy costs tied to $100-a-barrel-oil will keep it high. “For workers, this is as good as it’s going to get for a while,” said EPI President Larry Mishel. This is troubling news for everyone, because as paychecks shrink, consumers cut back on spending, reinforcing the whole recessionary cycle. It’s no wonder Democratic candidates are preaching a populist message: the anxiety they’re seeing on the campaign trail is real. Nancy CleelandNancy Cleeland writes for the Economic Policy Institute, a nonpartisan Washington DC think tank that seeks to broaden the public debate about strategies to build a more fair and prosperous economy. She has extensive experience reporting for newspapers on international trade, immigration and the low-wage economy, and co-authored a Pulitzer Prize-winning series on Wal-Mart's labor practices for the Los Angeles Times.